Zoanthid Present... surprise! | Saltwaterfish.com Forums for Fish Lovers! Hello all! We set up our 29 gallon BioCube 1 month ago. My husband, bless his heart, has no patience. Combine that with the wrong associate at the LFS and he decided to surprise me with a good sized Zoanthid Colony (+1 Mushroom) as a present. Oy. 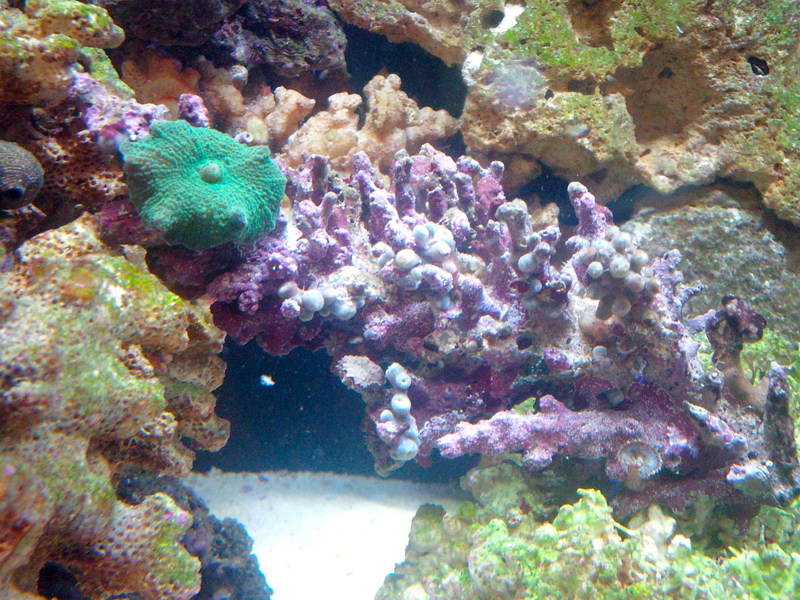 The Alkalinity seems on the high side but the Zoas don't appear to be sliming. Maybe increase the waterflow to see if that helps. What's the temperature? Just checked-81 and it seems to be pretty consistent. I can definitely try increasing the flow. Thank you. As far as the high alk, any advice on how to decrease that? I just did a water change a few days ago. Your ALK isn't critically high so just let it drop naturally on its own. Next time you mix up new saltwater test it to see if the Alk is too high. If not then you need to find the source. Are you using tap water? Nope, RO saltwater. We buy it mixed straight from the LFS who has a huge supply cheap for VIP members. That is the same LFS he bought the zoanthids. I increased their flow last night and they are still closed. Hoping they change their mind. Could they be getting too much light??? I don't thinks so from those lights. Maybe if they were MH's or LED's. What kind of lighting does your LFS use?? Maybe not enough light?? In the long run buying your own RO/DI unit and purchasing a bucket of salt will be more cost effective than buying water from the LFS. But... It is a lot of up front costs. I would suggest it more for having control over your system. What if something happened at night when the LFS was not open and you needed to do an emergency water change???? Having your own supply of RO/DI water and salt really does help a lot. Even if it is just piece of mind. Not to mention... How often does the LFS change their RO filters and DI resin??? Most of the time you end up paying a lot of money for water that is not that good. Our own unit is definitely on our "want" list-we just never considered it until I started reading on this forum and right now we don't have the upfront funds. UPDATE: as much as I pored over them for literally hours and was CONVINCED there were no pests... the more I looked into it the more I realized it was probably pests. SO I did a FW dip... 5 minutes then shake... well.. immediately I started seeing teeny tiny Nudibranchs falling off. At least five. Fingers crossed we've eradicated the problem, but I have a feeling there's eggs I'm not seeing. That being said, I planned on doing repeat FW dips every 5 days for the next 15 days to ensure I kill them off as they hatch. BUT can they be in the DT off the zoanthids and therefore escape the dip?? ?